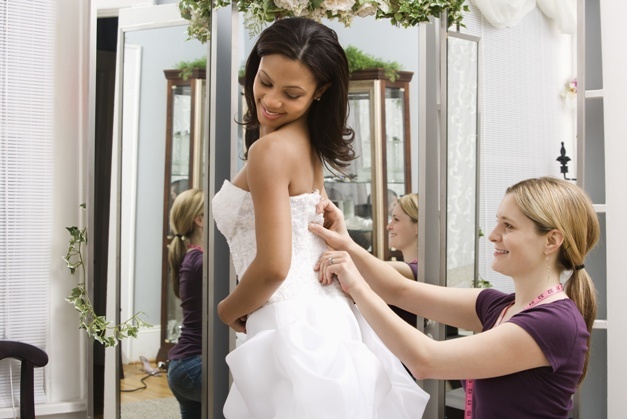 One of the worst mistakes you can make when wedding dress shopping is going there unprepared. You should do your homework and check some magazines and wedding dress websites to get an idea of what you want before the actual wedding dress shopping. Set your mind on some main preferences like color, style, dress type, etc. so that it will be easier both for you and for the sales person to find your best wedding dress. One of the most common mistakes almost every bride makes when wedding dress shopping is choosing the wrong people to accompany her. You should invite only people whose opinion matters to you and whom you trust. However, you should be aware of too opinionated and critical friends and family members as their harsh comments may easily ruin your day. Remember, wedding dress shopping should be about you and nobody else – don’t bring along anyone you suspect would take your spotlight! As difficult as it may be, you shouldn’t fall into the trap of the common scenario known as the “I must have that wedding dress even though it’s waaay out of my price range”. With the versatility of wedding dress options on the market, you are sure to find a worthy substitute that will fit both your style and your budget. You must be aware of the golden rule that when perfume shopping you should keep your daily fragrance testing withing certain limits as after the 4th perfume tester, they just all smell the same. Similarly, when wedding dress shopping don’t give in to the desire to try every dress that gets in your sight. This will not only take up a lot of your time and energy, but you will also end up with too many choices and not a single dress that you remember in details. Just like with regular clothes shopping, when wedding dress shopping it’s always best to look more at your reflection in the mirror and less at the size tag. Mind that the size of a wedding dress may vary from designer to designer and you shouldn’t fixate on the number as much. Another very common mistake future brides make is buying a wedding dress that’s a few sizes smaller and expect to have lost all the extra weight by the time they will actually wear it (the wedding day). Why is this a bad idea? Because any dress can be taken in up to 4 sizes, while few dresses can be let out more than 1 size!